With summer coming to an end and kids heading back to school, from coast to coast, young people everywhere will be trading sand and surf for books and homework. While locating all the items on your children’s back to school list might have consumed the majority of your attention, in today’s world, it never hurts to prepare them for the unexpected. It is an unfortunate reality that children today are faced with an uncertain and sometimes dangerous world. From severe allergic reactions at the lunch table to major catastrophic events, in this digital age, you can take steps to protect your children and keep them safe. The apps on your mobile device can do more than just stream music and guide you to your next destination. 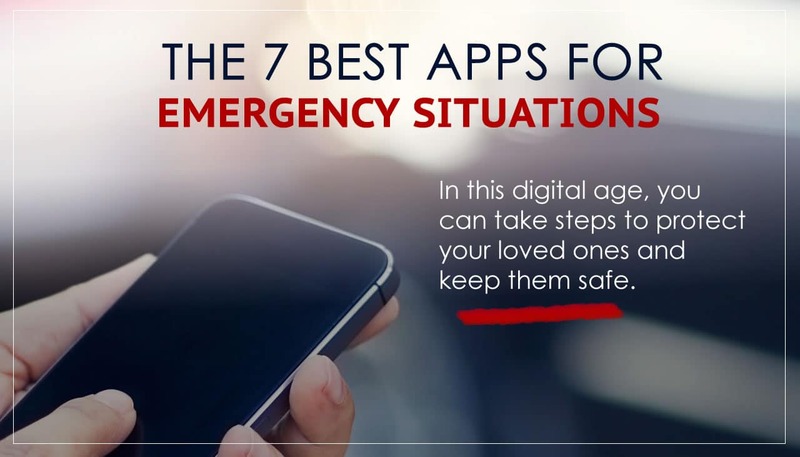 Apps can also serve as a vital resource in the event of an emergency and these are 7 of the best for a variety of emergency situations. From active shooters to suspected robberies, there are times when a silent alarm is the best approach. For sending out an SOS, the Life360 app is our favorite. Here are the relevant details. What it does: This app tracks the location of the user, letting loved ones know where they are in the event of an emergency. Users can send a request for help, and location data is provided to first responders. Most useful features: The Life360 app runs in the background, providing a steady stream of information. In an emergency, it sends an alert to your circle of friends and family, giving everyone a heads-up, and paving the way for a faster response time for first responders. Dangerous situations can happen to anyone, from seniors who suffer falls in their home to children exposed to an outside threat. When seconds count, the right app could literally be a lifesaver, and that’s where Guardian Defense comes in. The Guardian Defense app was created by two high school students in the wake of the Las Vegas shooting. What it does: Guardian Defense offers vital tools for a variety of emergency situations. Most useful features: The app includes a handy mapping feature, guiding users to a safe place like a fire or police station. Users can also send an “I’m Safe” message to their loved ones, setting their minds at ease. Guardian Defense even provides specific advice for various kinds of emergency situations. You never know when an injury will strike, and finding the first aid you need is vital. The American Red Cross is the recognized expert in first and emergency response, and their American Red Cross First Aid app is one of the best. What it does: This app provides expert advice for first aid emergencies, guiding users with simple, step-by-step instructions. Most useful features: The First Aid app includes an interactive quiz to help identify the symptoms of heat stroke, something that will come in handy on those hot days of summer. First aid can be helpful for your fur-babies too! For pet-related emergencies, the aptly named Pet First Aid app is the best choice. What it does: The Pet First Aid app comes courtesy of the American Red Cross, providing a wealth of valuable information for many common (and not so common) pet-related emergencies. Most useful features: Users can store veterinarian information, such as contact details within the app. You’ll enjoy the interactive quizzes that help you retain information that could one day help your furry family member. The app also offers tips for keeping pets safe during a natural disaster. Suicide is a growing problem that can be prevented if you know how to recognize the signs. With the pressures of daily life and the magnification of those stresses through social media, whether you’re worried about a suicidal friend or experiencing your own dark thoughts, A Friend Asks could literally save a life. What it does: Produced by the Jason Foundation, a well-respected suicide prevention group, the A Friend Asks app teaches users to recognize the warning signs of depression and suicide. The app allows loved ones to take proactive steps, getting the individual the help they need before it is too late. Most useful features: With the A Friend Asks app, users can access a list of common warning signs, including some that may not be so obvious. There is also a list of do’s and don’ts, so concerned friends and relatives don’t make a bad situation worse. Even in the age of GPS and interactive maps, road construction and spotty Wi-Fi can cause you to find yourself in a situation where you are completely lost. But have no fear, the right app can get you back on course. The Citymapper app is one of the best at getting you out of a sticky situation. What it does: Google Maps is still one of the most popular apps when it comes to directions, but city driving often involves road construction and detours which can throw you for a loop. For this reason, we encourage you to check out both Google Maps and Waze (also owned by Google). Most useful features: Waze is much more than a navigation app. In this app, multiple drivers work together to provide information about traffic accidents, detours, travel times, and even fuel prices. With Waze by your side, you won’t take a wrong turn or find yourself caught in a traffic jam again.Bonus tip: If you’re headed to an area where you anticipate you won’t have a cell phone signal, Google Maps makes it possible to download a map of an area in advance so you can still navigate when your signal drops. No matter where you live, you never know when a natural disaster will strike. From flash floods, to tornado warnings, Weather Underground is arguably the most versatile of the natural disaster apps, providing real-time weather updates and early warnings of tornados, hurricanes and other natural disasters. What it does: The Weather Underground app provides real-time information on all kinds of severe weather, including data on incoming storms and tornadoes. The app also provides detailed forecasts and radar maps, so you can track the progress of the storm both from your current location and the place you call home. Most useful features: This app provides real-time notifications, so you can stay safe and steer clear of natural disasters. The app costs $2, but that is a small price to pay for safety, peace of mind, and a steady flow of real-time information. Your smartphone is a valuable tool for work and play, but in extreme circumstances it could be a lifesaver. The 7 apps listed above could be your best friend in a disaster or emergency situation, so we encourage you to evaluate each one and download those you find most useful. Hopefully you will never need them, but it is nice to know they will be there if you do.